There’s a world of difference between creating a flavor that’s novel on a potato chip vs. creating a flavor that compels you to finish the entire bag. One satiates your curiosity once, the other stands for repeated snacking. 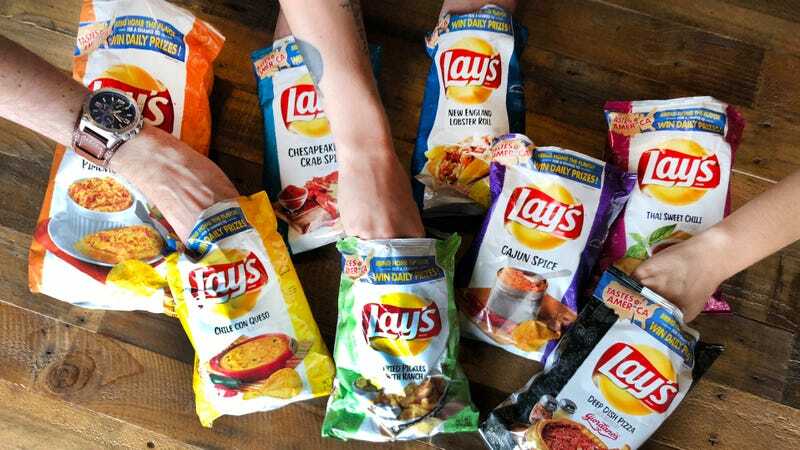 The good news with Lay’s 2018 line-up of new chips is they’ve taken away (for now) the public contest element, opting instead to introduce eight new flavors inspired by regional American cuisine. The flavors seem less wacky than previous campaigns, and by dialing back the gimmickry, these chips—for the most part—passes the repetitive hand-to-mouth test. The caveat: Each of the eight regional flavors will only be sold in stores until Sept. 23 in their respective markets (though all eight can be bought online). So say you’re in Atlanta and wish to try the New England-inspired lobster roll—you won’t find it at your neighborhood Kroger. More good news: None of the eight flavors taste off-putting. The worst you can say is some of the flavor don’t match the dish it’s attempting to replicate. Pimento Cheese (sold in the Southeast), for example, tastes like the existing cheddar-and-sour cream flavor, with no suggestions of piquant pimento peppers. New England Lobster Roll suffers the same fate, with a predominant taste of butter and chives in the background. (Perhaps Lay’s could have borrowed a page from those puffy shrimp chips served in Southeast Asian restaurants as a reference for lobster flavor.) On the other side of the spectrum, Thai Sweet Chili (sold in the Pacific Northwest) has a complex and satisfying sweet and sour profile, but its strong after-taste of basil ultimately made the chip too floral. Where Lay’s finds success in its 2018 line is by borrowing existing chip flavors from other companies and mellowing it out to a mass-market audience. Its Chesapeake Bay Crab Spices (sold in the Mid-Atlantic) is a good example: It’s clearly piggybacking on Utz’s and Herr’s Old Bay potato chips. But whereas Herr’s is rather heavy handed with Old Bay seasoning, Lay’s version dials back on the celery seed flavoring and balances it out with salt-and-vinegar tang. I prefer Lay’s dialed-back version. Likewise with its Fried Pickles with Ranch (Midwest). I I know some like that sharp bite of dill pickle chips, but I find Lay’s version, which balances out acid with a creamy, buttered ranch finish, a good gateway into the world of pickle-flavored snacks. The one major criticism: None of these are kettle-style, which should be standard for all potato chips in 2018. Previous Lay’s offered kettle and ruffled options, but these are the standard thin and brittle-style that’s missing crunch and a satisfying tactile heft. Textural complaints notwithstanding, these new chips have both flavor uniqueness and repeatability. There’s still a long way for American chips to catch up to British crisps sophistication, but it’s certainly trending in the right direction.